Of these four, the larynx, especially its subglottic region, is the most common site because this is the narrowest point of the pediatric airway. The causes of subglottic stenosis may be divided into congenital or acquired lesions, and these will be considered separately because of the differences in pathophysiology, evaluation, and treatment of each. Congenital subglottic stenosis is defined as subglottic stenosis in the absence of a history of intubation, other laryngeal trauma, or extrinsic compression, such as a vascular malformation like a double aortic arch. The child may present at birth, in the neonatal period, or in the first few weeks or months of life. It is caused by failure to recanalize the lumen of the larynx and trachea in embryonic life, thus resulting in atresia, webs , or stenosis. Not unexpectedly, there is an increased incidence of other lesions in the airway if one area is already affected. The children appear reasonably well with normal growth and development, but they come to the physician's attention because of stridor. The stridor may have an expiratory component as well as the normal inspiratory component , ie, biphasic (SOUND). The child may also present with dyspnea, a brassy or barky cough, hoarseness, and/or weak or unusual cry. A prolonged episode or unusual course of croup may also bring the child to attention. The physical examination findings depend on the amount of obstruction in the airway. The child may have only a minimal amount of obstruction, and normally may be without symptoms. But obstruction of the airway may rapidly increase when the edema caused by an URI is superimposed on the already compromised airway. 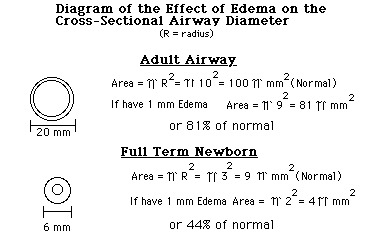 For example, 1 mm of edema in the subglottic region will decrease the cross-sectional area of the airway by over 50% . Obviously, if the original obstruction is severe, the child will present early and with more severe symptoms, including presentation of stridor in the delivery room (SUMMARY) (SUMMARY). Evaluation of the child with possible congenital subglottic stenosis may include the use of endolateral neck x-rays to look for narrowing in the subglottic region. 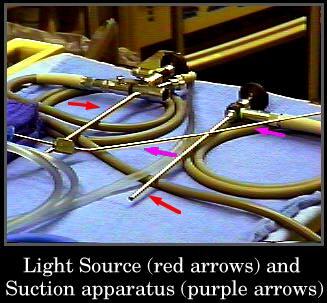 Bronchoscopy, or the more correct term laryngoscopy if only the laryngeal structures are visualized, is needed for complete evaluation of the airway, to rule out other anomalies, and for definitive diagnosis (SUMMARY) . Bronchoscopy shows marked soft tissue swelling 2-3 mm below the vocal cords. Occasionally, the lumen is eccentric with greater involvement of one area of the wall. Treatment of the disorder is based on etiology and amount of obstruction. Most children outgrow their subglottic stenosis and require only expectant watching. 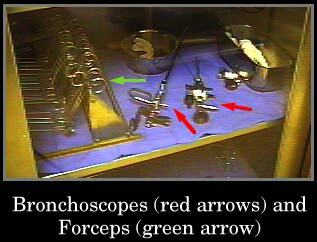 Occasionally, repeat bronchoscopy for evaluation of progress is needed. Other children may require periodic dilatation with tracheal dilators . Because the inelastic cricoid cartilage allows only the inward swelling of tissues, tracheotomy may be needed. This should be done with the smallest size tracheostomy tube to allow adequate ventilation and preservation of laryngeal function for speech. Operative laryngo-tracheoplasties may also be needed in some children. Aggressive supportive treatment including antibiotics, corticosteroids, and occasionally mechanical ventilation, during intercurrent illnesses, is also needed by these children. Generally, they outgrow their stenosis by age 3 - 4 years (SUMMARY). In between these events, children with tracheostomies lead very normal lives . Even tracheostomy tube changes cause little disruption of their daily activities . Differential diagnosis includes vascular malformations, laryngomalacia, asthma, croup, or bronchiolitis. The complications of the disorder are respiratory failure, with mechanical ventilation and its concomitant complications , and problems secondary to the tracheostomy itself, such as increased risk of infections. It is interesting to note that these children do have an increased risk of respiratory infections out of proportion to normal children even accounting for problems such as having a tracheostomy. Acquired subglottic stenosis is caused by trauma to the subglottic structures secondary to endotracheal intubation but also due to a foreign body, infection, or chemical irritation. The respiratory epithelium is very susceptible to irritation, and, if it persists, the original edema and hyperemia progress to ulceration and local infection with growth of granulation tissue . If irritation still persists, destruction of the underlying cricoid cartilage and other cartilaginous supports occur. When the source is finally removed and healing can take place, the scar tissue contracts circumferentially producing a stricture or even complete stenosis. The age of initial diagnosis varies considerably from 2 weeks to 10 years or more, with the majority being less than 1 year old. The clinical presentation and physical examination of children with acquired subglottic stenosis is the same as those of children with congenital subglottic stenosis. The history generally reveals endotracheal intubation for a period of time or other insult such as a foreign body or chemical aspiration. If the cause is endotracheal intubation, the child may present with inspiratory stridor just a few hours after extubation. Evaluation of these children also begins generally with endolateral neck x-rays that reveal various amounts of subglottic narrowing. The narrowing can be severe with a steeple sign similar to that of croup, but it is most often can be subtle. Bronchoscopy, however, shows more severe stenosis than is found in congenital subglottic stenosis. Circumferential stenosis with an associated web or band is often noted. Vocal cord paralysis may also be seen . Treatment of these children needs to be more aggressive, because the problem is usually more severe than with congenital stenosis. If the child presents within a few hours of extubation, racemic epinephrine nebulization may be all that is needed. Frequent arterial blood gas analysis for monitoring of hypercarbia and possible respiratory failure may be futile as many children have normal blood gas analysis until they are in frank failure. If the child shows progressive symptoms, reintubation may be necessary and a course of corticosteroids should be used before the next attempt to extubate. For those children who fail this second attempt at extubation, a surgical procedure is indicated. A cricoid split tracheoplasty or laser surgery may be used to avoid tracheotomy, depending on the individual clinical indications. 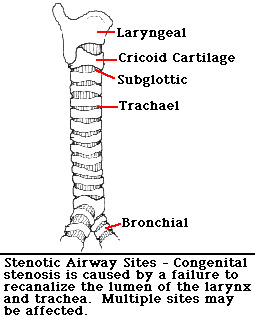 Many more children require tracheotomy for acquired subglottic stenosis than those with the congenital type. They also require repeat dilatation and/or endoscopic removal of granulation tissue more often. Children with tracheostomies do well and can be decannulated in 1-2 years. These children tend to have a higher morbidity and mortality due to their underlying disease such as hyaline membrane disease and have longer hospitalizations (SUMMARY). The differential diagnosis and complications for acquired subglottic stenosis are the same as those for congenital subglottic stenosis. 1. The subglottic region is particularly susceptible because it is the narrowest part of the pediatric airway. 2. It may be congenital or acquired. 3. Children with this disorder have more morbidity and mortality than children with infectious airway processes. 4. Over the long term, children do well as they outgrow this disorder.